The North Caroliniana Society generously supports the North Carolina Historical Review, the statewide National History Day Program and ANCHOR (A North Carolina History Online Resource). Since 1924 the North Carolina Office of Archives and History (known from its founding in 1903 as the North Carolina Historical Commission) has published a quarterly, the North Carolina Historical Review, as a platform for dissemination and discussion of North Carolina history. Typical issues contain three articles and twenty book reviews. R. D. W. Connor and Robert B. House edited the inaugural issues. David Leroy Corbitt, hired as assistant editor in 1926, had primary responsibility for the Review through 1960. Corbitt’s successors have included Memory Mitchell, Marie D. Moore, Jeffrey J. Crow, Joe A. Mobley, Kay B. Wyche, William A. Owens Jr., and Anne Miller. Two endowments administered by the North Caroliniana Society, built upon funds left to the Society by Jerry C. Cashion and Joseph F. Steelman, underwrite printing of the Review and other associated costs. North Caroliniana Society sponsors N.C. History Day as part of their continuous commitment to provide support to North Carolina students and teachers. N.C. History Day is administered by the N.C. Department of Natural and Cultural Resources and is an affiliate of the National History Day program (www.nhd.org). National History Day is a yearlong academic program that engages students in grades 6 through 12 with the discovery of history. 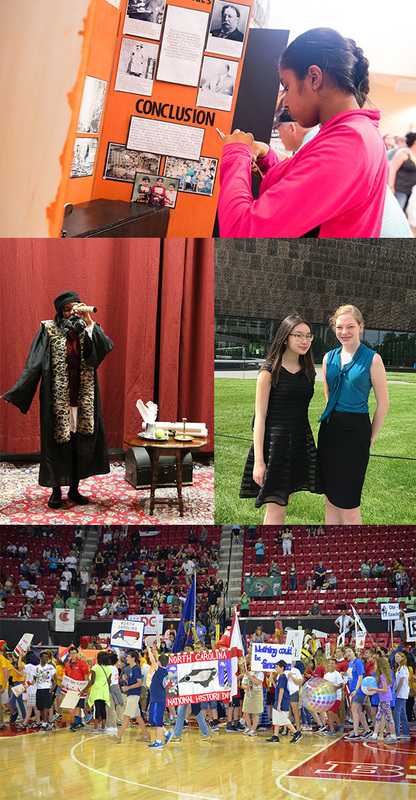 Students choose historical topics related to an annual theme, conduct extensive primary and secondary research, analyze and interpret their sources, draw conclusions about their topics’ significance in history, and present their work in one of five categories — historical papers, websites, exhibits, performances, or documentaries. Students first compete in one of the seven regional contests across the state. Approximately 5,000 students from 75 different schools currently participate at the regional level. Regional finalists are then invited to attend the state contest held every April at the N.C. Museum of History and Archives & History Building in downtown Raleigh. The state contest typically has over 400 student attendees. The top two finalists in each category and division are then selected to represent N.C. at the national contest, held each June at the University of Maryland. With guidance from staff and judges, students can improve their projects at each stage of the competition and continue to research and learn. Funding from the North Caroliniana Society also allows N.C. History Day to provide support to teachers through resources, trainings, and classroom visits. These resources and programs focus on incorporating historical research and primary sources in the classroom. The Society’s sponsorship also funds seasonal staff assistance for the regional, state, and national contests and provides the H.G. Jones award at the state contest for excellent projects in North Carolina history. The North Caroliniana Society is partnering with the North Carolina Department of Natural and Cultural Resources (DNCR) and Carolina K-12, a program of Carolina Public Humanities at UNC-Chapel Hill, on a one-year project called “Supporting Education with North Carolina Curricula and Content (SENCCC). SENCCC addresses the need for resources for students and educators for articles, images, digital primary sources, educational activities aligned with the North Carolina Essential Standards, and more by expanding, updating, and further developing ANCHOR (A North Carolina History Online Resource). 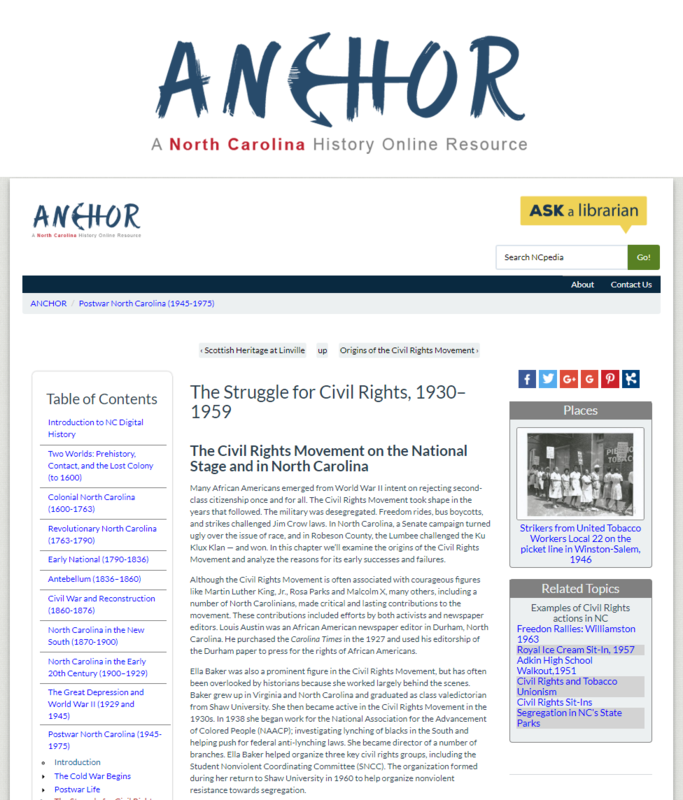 ANCHOR is a trusted digital textbook originally developed by UNC-Chapel Hill’s School of Education and available online at https://www.ncpedia.org/anchor/anchor. ANCHOR will continue to be freely available online, and thus, accessible to students, educators, and researchers everywhere. Funding from the North Caroliniana Society makes this project possible by covering the development of new articles, activities, lesson plans, videos, interactive features, and more into ANCHOR for those North Carolina topics educators have indicated to be of greatest need for their classrooms.